Gronomics ECO Garden Wedge Extension, Brown. Dimensions: 34L x 30W x 32H in. Natural, unfinished wood for a rustic look. 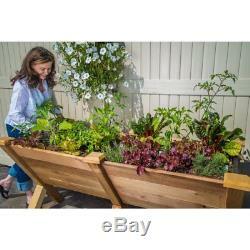 Extends your existing garden wedge. The Gronomics ECO Garden Wedge Extension allows you to expand your existing Gronomics garden wedge, resulting in more space to plant, tend, and harvest. 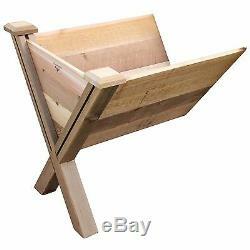 The durable frame is crafted from solid Western red cedar and comes with a natural finish. The depth of the unit holds plenty of soil, ideal for everything from herbs to deep-root veggies, and makes it easy for you grow everything you want without digging up your yard. This piece sits at a comfortable height for wheelchair access. With Gronomics, you no longer need a big yard to do your gardening. The Minnesota-based company manufactures unique, ergonomically designed 100% Western Red Cedar garden planters that offer tool-free assembly. Gronomics makes everything from elevated beds, raised beds, planter benches and much more, all of which are designed to make gardening easy and more accessible for all ages. Herbs, vegetables and flowers can all be tended to while standing or sitting and the company's unique designs even allows easy access for those in wheelchairs. Dimensions: 34L x 30W x 32H in.. This listing is currently undergoing maintenance, we apologise for any inconvenience caused. The item "Gronomics ECO Garden Wedge Extension, Brown" is in sale since Friday, January 19, 2018. This item is in the category "Home & Garden\Yard, Garden & Outdoor Living\Gardening Supplies\Plant Care, Soil & Accessories\Baskets, Pots & Window Boxes".